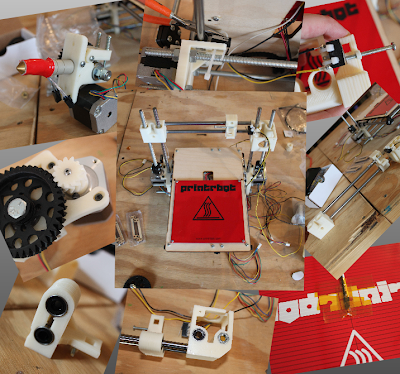 The Dayton Diode membership pooled our resources to help fund the Printrbot Kickstarter. The magnitude of the response to that Kickstarter was pretty amazing (and I think unexpected by the Printrbot folks). 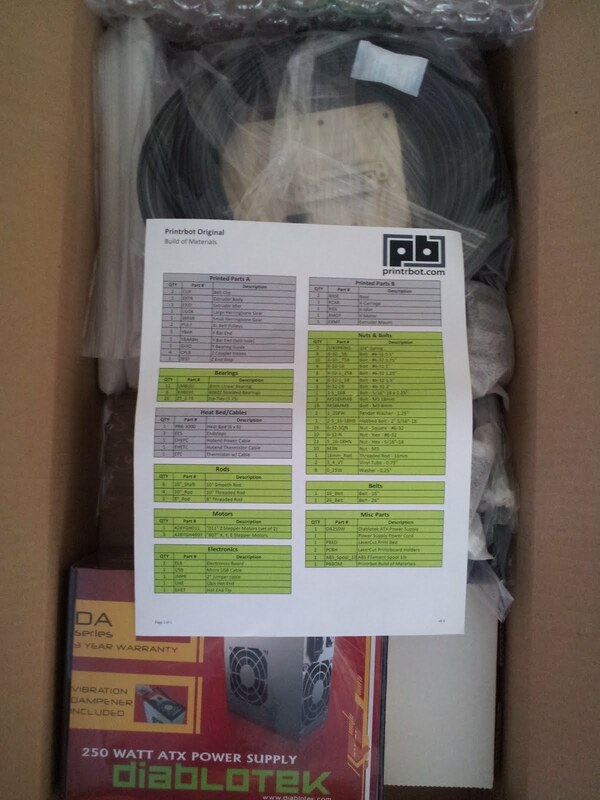 It took them a while to scale up to meet that demand, but we've finally received our Printrbot kit! The exciting thing to me about this printer is the quality of parts that are achievable with these pretty inexpensive devices (the big unknown to me right now is how much calibration and tuning is required to get to that level). 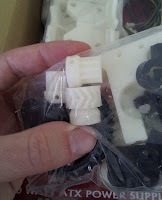 I was really impressed with the quality of the RepRapp'd parts that Rockett got for his Prusa Mendel printer. These Printrbot parts are at a similar level. 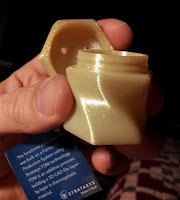 Just for fun and out of my idle curiosity, a while back I requested a sample part from Stratasys, and these parts seem to be of equivalent quality as far as I can tell with my Mk-I eye-ball. Watch the mailing list and the meetup for a build event announcement. We'd like to get plenty of folks involved so we can do a proper job of documenting our build. We (Joe, Rockett, Dan and I) got the first plastic squeezed at an open house. It's supposed to be a 20mm cube. Our x-axis is slipping. One of the optional steps I skipped was 'flatting' the shafts on our stepper motors to give the set screws a better interface: do it! NOT OPTIONAL. Joe and I got through build video's 1-8 this afternoon. I didn't have any kapton tape for the thermistor; we also need a 6x6 inch piece of glass to finish up the build platform. Just about ready to load software and start calibrating. 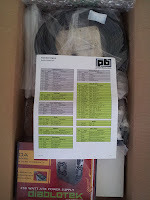 All the nuts and bolts are done; ready to hook up the electronics and load software. How can I integrae Slic3r with Printrun? 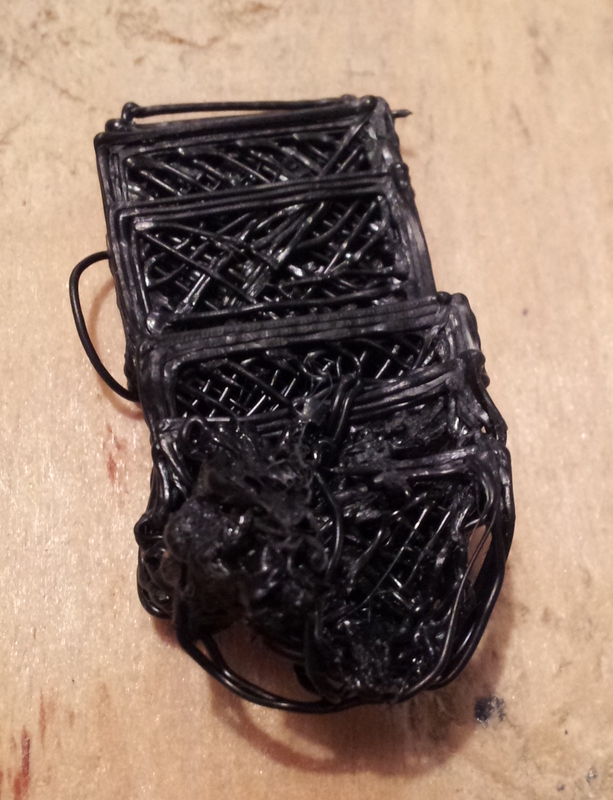 On our first print / calibration attempt we found the bed is not very parallel with the x/y axes. Here's a good fix: using small pieces of flexible tubing as adjustable shims for the print bed.